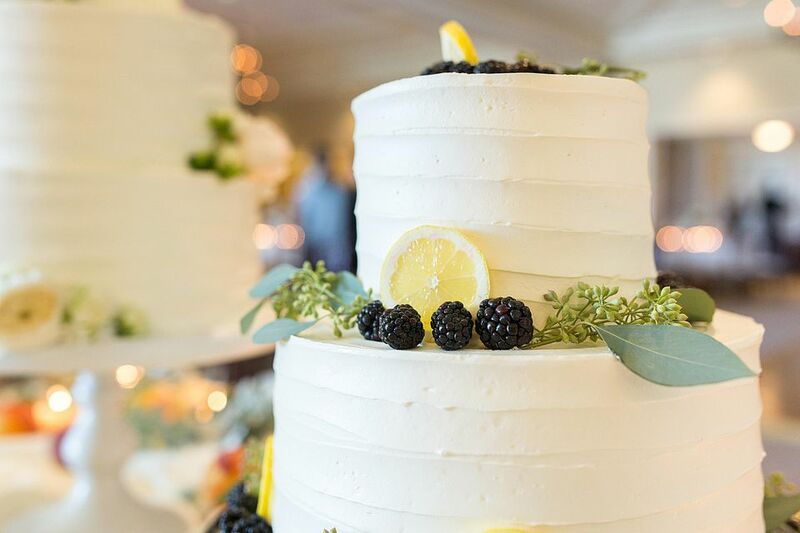 Cakes come in many sizes, shapes, and configurations—and that can make it tricky to know what cake design is appropriate for the number of guests expected for an event. Round, square, and heart-shaped cakes each produce different numbers of portions; unusual octagonal or hexagonal cakes yield a similar number of portions as their square counterparts. The type of cake also will determine the number of portions you can cut from it. For example, traditional fruit cake is firm and can be precisely cut into very small pieces. But an ice cream cake often begins to melt before it’s completely served. Most ceremonial wedding cakes are made with two or more layers of cake with icing between those layers. Slices are typically 4 inches high and 2 inches long by 1 inch wide. When estimating the size of a wedding cake, assume the serving size will be at least that big and then figure out how many are needed for the guest count. Always add extra servings because you may end up inviting more than initially planned or people may want second helpings. Also, consider whether the portions are meant to be a dessert or the cake-cutting is more ceremonial in nature: Dessert portions should be bigger than the traditional 2 inches by 1-inch piece of cake. Sometimes cutting different tiers of a cake to get the correct number of portions is confusing, especially round or heart-shaped creations. Before the reception or event, create a plan for how the cake should be cut to avoid running out or having too much cake left over. Exclude the top tier from your calculations because you may choose to remove it and keep it for your first anniversary. Remove top tier if keeping it. Cut a smooth, evenly spaced circle about 2 inches in from the second tier's outer edge. Cut the ring into slices that are about 1 inch across. Cut another circle 2 inches farther in and slice that ring into 1-inch pieces. Continue this process until you have only a small circle of cake left in the center. Cut the core into pieces that measure approximately 1 inch along the outer edge. Remove the cake board and dowels and repeat this process with the next tiers until all the cake is cut. Cut the second tier straight across, approximately 2 inches in from the outer edge of the cake. Slice the 2-inch strip into 1-inch pieces. Continue cutting 2-inch-wide strips and cutting those strips into slices that are 1 inch across until the cake is completely cut. Remove the cake board and dowels and repeat this process with the next tiers until every tier is cut. Sometimes, no matter how carefully you plan, you end up with either too few slices or too much cake. To be perfectly accurate with portions for an event, a good backup plan is to serve cupcakes instead of cake. Cupcakes can be configured into an elegant configuration on stands and you can bake only the number of cupcakes you need for each guest. No cutting or math required! Of course, you'll want to make a few extras for those who want seconds.